A Tale of Two Truck Crashes | Phoenix Personal Injury Law Blog - Breyer Law Offices, P.C. A recent crash involving five people and one transport truck on 59th Avenue and Lower Buckeye Road has highlighted just how dangerous accidents involving trucks can be. But it wasn’t the only truck crash around that time, nor is it likely to be the last one this year in Arizona! In the early morning hours of August 7th, just minutes before many started their weekday commute, a tanker truck carrying 8,000 gallons of jet fuel rolled over. The most damage was done to a pickup truck the tanker rolled on, which was being driven by a 25-year-old man. Three other people were also involved in the crash. Each was in her own separate vehicle, and while all five people—the four victims and truck driver—were transported to trauma centers, everyone survived without major injuries. The tanker leaked only150 gallons of fuel, which officials said posed little threat to the environment. The road was blocked for hours while the fuel was transported to another truck, and the scene of the accident was cleared. While this accident ended relatively happily for the people involved (until they get their bills), not everyone is so fortunate when meeting too closely with transport trucks on Arizona’s highways. Almost exactly a month before the rollover on 59th Avenue, a tragic accident occurred on I-10, also in the early morning hours. Again, a semi-truck collided with a pickup truck, but in this case, the driver of the pickup truck died at the scene. As investigators worked to analyze the cause of the crash, the highway was closed for several hours between the 51st Avenue and 59th Avenue exits. Unfortunately, the results of this crash are much more common. Trucks are much larger, have bigger blind spots, and have a greater centrifugal force, so when they crash into other vehicles, the occupants of other vehicles end up sustaining severe injuries or dying. And Arizona sees far too many of these accidents. How Common Are Tractor-Trailer Crashes? According to the Arizona Department of Transportation, the state sees over 2,565 accidents involving transport trucks every year. More than 20% of these accidents involve more than one victim, and in a typical year, 50 of those accidents result in fatalities. So what can Arizonans do to avoid being statistics? First, it’s important to know where these trucks usually are. While transport trucks can be seen on just about all of Arizona’s roads, they’re particularly prevalent on highways and interstates. I-40 is a major travel route for tractor-trailers, as is I-8. Both of these routes go between Arizona and California, so trucks go mainly to export Arizona’s cotton and to import steel from Los Angeles and other parts of Southern California. Of course, Arizona needs more than just imported steel delivered into it. I-17 and non-interstate highways, such as the 60, are used by transport trucks when they’re carrying a number of goods within the state. These trucks carry automotive parts, consumer products, retail products, foods and beverages, housing and construction parts, manufacturing parts and equipment, and even paper products. A secondary accident is any accident that results from another accident. For instance, if an 18-wheeler rear-ends a minivan, any accident that happens immediately after, but is not part of the initial accident, would be a secondary accident. Although investigators are still analyzing the crash on 59th Avenue, any one of the women involved may have been part of a secondary accident, as the initial accident occurred when the tanker rolled over onto the pickup truck. It’s estimated that the risk of a secondary crash increases by about 2.8% for every minute the initial accident is a danger to drivers. It’s for this very reason that authorities will always try to close the roads and clear the debris before allowing other vehicles on that portion of the roadway. The most common type of secondary accident is when one vehicle rear-ends another vehicle. In most instances, this is still the “fault” of the driver who rear-ended the other vehicle, even if the vehicle in front stopped suddenly to avoid crashing into a wreck. This is because vehicles traveling behind other vehicles have a responsibility to keep a safe distance from the vehicle in front of them. Drivers who don’t leave that “safe space” will likely be considered negligent and be responsible for paying compensation for things such as medical bills, lost income, and pain and suffering. Secondary accidents are also caused by drivers who rubberneck, or twist and turn so that they can see what’s going on with the accident scene. When a driver takes his eyes off of what’s in front of him…let’s just say all sorts of bad things can happen, like hitting pedestrians or swerving into oncoming traffic. If you rubberneck, you’d likely be found at fault for the resulting accident under Arizona’s distracted driving laws. Although any accident poses significant risk to people, it’s clear that those involving tankers and transport trucks are the worst. Because of this, always pay attention to what’s going on in front of you. And while it can be difficult to avoid tractor-trailers (other than taking a route less traveled), there are things you can do to avoid a secondary accident. All drivers should be on the lookout for flashing lights ahead or behind when you see an accident, and be aware of other vehicles around you. Don’t follow the vehicle in front of you too closely—leave yourself plenty of time to react when the unexpected happens. 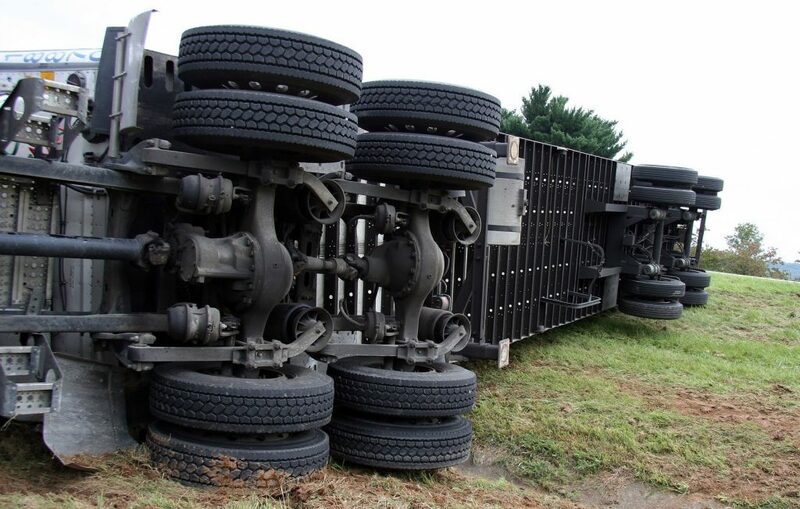 If you are hurt in a tanker truck accident, you’re not alone. The Husband and Wife Law Team at Breyer Law Offices, P.C., can help.